The Kendall Howard 48" Power Strip combines state-of-the-art electronic protection with a basic but attractive design that is perfect and safe for the home and contemporary workplace. Its sleek shape and design allows for easy mounting to any training table, LAN station or other workstation, but also conveniently cozies up to any wall saving you valuable floor space. If mounting the Power Strip up on a desk, shelf or rack, two mounting brackets are included making installation simple. Complete with 16 outlets, the Kendall Howard 48" Power Strip is suitable for the home, office or warehouse to house your computers, telephones, lighting fixtures, and more. (The Power Strip can only be installed on Accessory Bars 60" or longer, or the Corner Accessory Bar.) High Quality Surge Protection - With the industry's highest surge protection at 1,060 Joules, this masterfully engineered UL approved power strip offers quality, performance, and security. 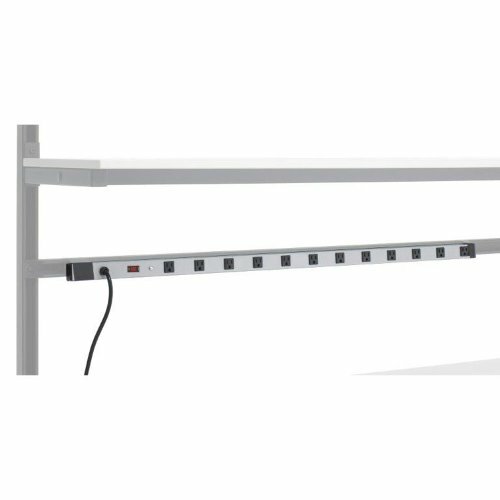 Space Saving Design - The narrow structure of the Power Strip allows for easy installation to the wall or work stations, but also rests nicely against any wall providing more floor space. Numerous Outlets - Equipped with 16 outlets, this Power Strip allows you to safely plug in numerous appliances or pieces of equipment in one location.